Malacca is well on course to achieve its target to become a Green Technology City State in 2020. Last month the government kicked off the construction of the first state-owned solar farm in the country. Hats off to the team! Not to deny the effort of other conglomerates and the private sector, but Malacca has to be given credit for the initiative. It started it's green initiative long before the feed-in tariff structure was drawn out by SEDA. The other notable solar installation is Cypark's Pajam 8MW solar park in Negeri Sembilan. If the FIT rate is RM0.98 per kWh of energy produced, annual revenue based on the above estimated figure would be (6,162,000 x 0.98) = RM6.04 mil. So, yes, it is a viable investment and it create job opportunity for the people. Plus, there will be spin-off business activities, at lease in Malacca. I am assuming that this production is based on solar irradiation of 3 to 3.5 hours a day, which is quite conservative, but perhaps taking into account rainy days as well. We understand that in Sabah the good sun irradiation period is longer. ALOR GAJAH: THE Malacca government will be the first in the country to build and operate its own solar farm, costing RM46 million, in line with its mission to be a green technology city state by 2020. The 5MWp solar photovoltaic (PV) solar farm will be built on a 7,248.43ha site at the Melaka World Solar Valley in the Rembia Industrial Area. This will be done in three phases -- the first phase to produce 1.3MW will be completed in December, the second phase (1.22MW) will be ready by January next year and the final phase (2.48MW) in February. The project is being developed by Kumpulan Melaka Berhad (KMB), which is wholly owned by Chief Minister Incorporated. 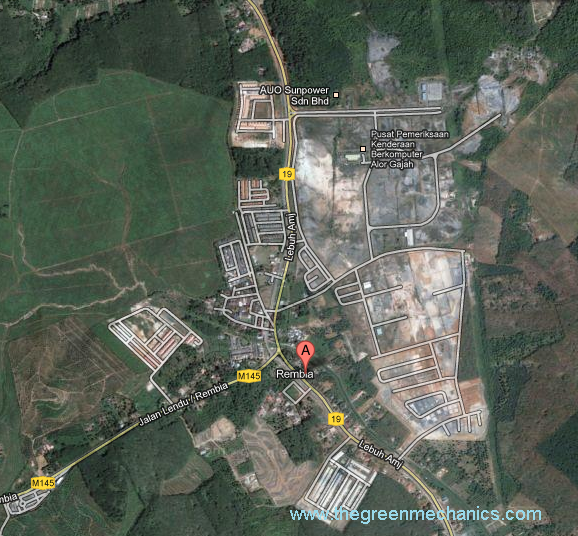 The proposed solar farm to be build at Melaka Solar World Valley. Chief Minister Datuk Seri Mohd Ali Rustam said all the power generated by the solar farm would be sold to Tenaga Nasional Berhad and the electricity would be channelled directly into the national power grid (NPG). "The power harvested from sunlight will be channelled into the NPG in three phases obtained which will be on Dec 15, and Jan 15 and Feb 15 next year." He also said the plant would be able to supply 17MW a day to the NPG. "In a month we will be able to sell 514MW to TNB and in a year, it will come up to 6,162MW. "We expect that after servicing the RM41 million loan which we had taken from the Malaysia Debt Ventures Berhad (MDV), a company owned by the Ministry of Finance Incorporated, we would be able to make a profit of RM73 million after 21 years." Rustam said this after performing the groundbreaking for the plant and witnessing the signing of the agreement to finance the project between KMB and MDV at the Melaka World Solar Valley yesterday. Present were Energy, Green Technology and Water Deputy Minister Datuk Noriah Kasnon and Sustainable Energy Development Authority chairman Tan Sri Dr Fong Chan Onn, who is also Alor Gajah MP. 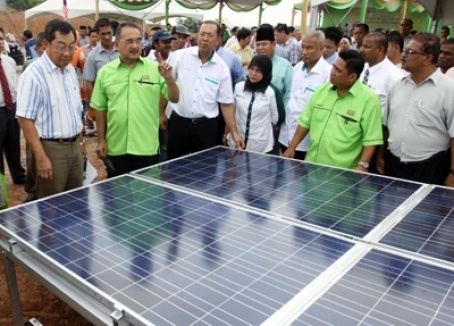 Mohd Ali said two more solar farms would be developed in Jasin and the Krubong landfill.